Friend: Hows everything down there? Friend: Must be enjoying, really hard. After a pause when I don’t reply. Friend: Don’t you Miss Bhutan? Of all the fancy places I see in the movies may perhaps be the most exotic places on earth, but it definitely do not have the love of your mother, care of your father, and the familiarity of yourself. The mother’s place, be it a shed covered with rotten carcass of shingles or the mud-baked house where my parents live, it’s still the place where a soul within me is set in vibrant resonance of love and happiness. Its now almost more than a six months I visited Bhutan last time. I am dying here to walk peacefully along the roads. I am done with walking down the boulevards. I would die trying to familiarize myself to these things and ending up hating to have known things which are tough when you don’t know and tougher to catch up after you know it. A day in Delhi on the streets would mean many things; my first day in Delhi (that was four years ago), I and my friends end up being conned, the rickshaw men are few from whom we learn a lot these days- they are perfect example of how someone new in place can be naive and foolish. Sometimes, even after I wake up from my nap, the bus would still be struggling to reach my station with roads filled with cars. I have never been on the roads crowded with cars. The metro trains have similar stories. Life moves at the pace of electronics and gadgets. When these wheels are jammed, life stops to flow slickly. And scary thing about this life here amidst all this happening around is that I am lonely and unfamiliar. Another thing that makes me really desire I were in Bhutan is food. I die here for Bhutanese food. I don’t wish to eat foods cooked by my mom, but anything that is as good as ema datsi would do, but it has remained as some sort missing dream. Seems like, I have left the dreamland for some bizarre land on earth. 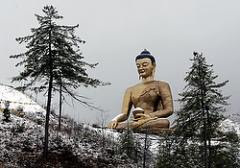 By now, in some parts of Bhutan, there must be white flakes descending gracefully leaving every mesmerized creatures adorned with snow. The pristine beauty of Himalayas would have lit even the darkest of souls, and would have injected the refreshed air of sacred life in souls lingering around, with all peaks ushering the early sun shines over its whitened self. Life will be grandeur and I am missing to be a part of the celebration. My sister would have now learned to recognize people, if not the ones around her at house at the least. She would soon become a year old, and I will be the only one to miss her birthday. The guilt hovers over me! I don’t remember when is the last time I stood up to form a circle and dance during losar, and celebrating it here with few friends do not really give me the chill-pill I will get lest I am in Bhutan. I miss walking freely, I miss hearing the chirping of birds, I miss the mowing of cows, I miss taking bath in fresh mountain rivers, I miss watching the lights of the few vehicles, those lights moved so beautifully and made a perfect show for my young brothers, I miss evening walk on the road along the Punatsang chhu, and I miss my simple life in Bhutan. Rang Yuel Zampai Wog Lu in rung Gaa…because it’s not just the place where you have some identity or some territorial advantage, but for the simple reason that it’s where your soul is at ease and feels warm. There’s no need to understand the reason why it is so? Lets even ask God, He won’t be able to justify why man prefer to live at the embrace of lovely parents of one’s than in heaven. It’s all simple and sacred, and there’s unknown incognito understanding about it.